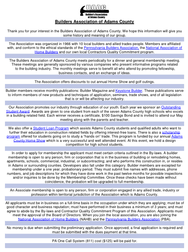 Thank you for your interest in the Builders Association of Adams County. We hope this information will give you some history and meaning of our group. The Association was organized in 1966 with 10 local builders and allied trades people. Members are affiliated with, and conform to the ethical standards of the Pennsylvania Builders Association, the National Association of Home Builders and our own local Contractors Quality Commitment program. The Builders Association of Adams County meets periodically for a dinner and general membership meeting. These meetings are generally sponsored by various companies who present informative programs related to the building industry. The monthly meetings serve to benefit all who attend by promoting fellowship, business contacts, and an exchange of ideas. The Association offers discounts to the annual Home Show. Builder members receive monthly publications: Builder Magazine and Keystone Builder. These publications serve to inform members of new products and techniques of application, seminars, trade shows, and of all legislation that is or will be affecting our industry. Our Association promotes our industry through education of our youth. Each year we sponsor an Outstanding Student Award. Awards are given to one student from each of the seven Adams County high schools who excels in a building related field. Each winner receives a certificate, $100 Check and is invited to attend our May meeting along with the parents and teacher. We also offer a Student Loan Program which assists Adams County students and qualified adults who want to further their education in construction related fields by offering interest-free loans. There is also a scholarship program offered for students going on to study a “hands on” trade. This program is funded by our annual Adams County Home Show which is a very successful and well attended event. At this event, we hold a design competition for high school students. In order to apply for membership the applicant must meet certain criteria outlined in the By-laws. A builder membership is open to any person, firm or corporation that is in the business of building or remodeling homes, apartments, schools, commercial, industrial, or subcontracting; and who performs this construction in, or resides in Adams or surrounding counties. Developers also fall under this category. Builder members are excepted for membership under a one year, probationary period. They must submit five names with addresses, phone numbers, and job descriptions for which they have done work in the past twelve months for possible inspections and/or inquiries to be done by the Membership Committee. Once these checks have been made without coincidence, the probation will be upgraded to full membership. An Associate membership is open to any person, firm or corporation engaged in any allied trade, industry or profession within territorial jurisdiction of the Association which is Adams County. All applicants must be in business on a full-time basis in the occupation under which they are applying; must be of good character and business reputation; must have performed in their business a minimum of 3 years; and must agree to abide by the By-laws and Contractor Quality Commitment Program of this Association. Applicants must meet the approval of the Board of Directors. When you join the local association, you are also joining the National Association of Home Builders (NAHB) and the Pennsylvania Builders Association (PBA). No money is due when submitting the preliminary application. Once approved, a final application is required and must be submitted with the dues payment at that time. PA One Call System (811) cost ($125) will be paid for.